Torso and upper body measure wider than your hips. Little or no waist definition. You might have extra weight surrounding your waist. Tummy area is a big concern for you. Your legs tend to be slim and amazing – So use them! 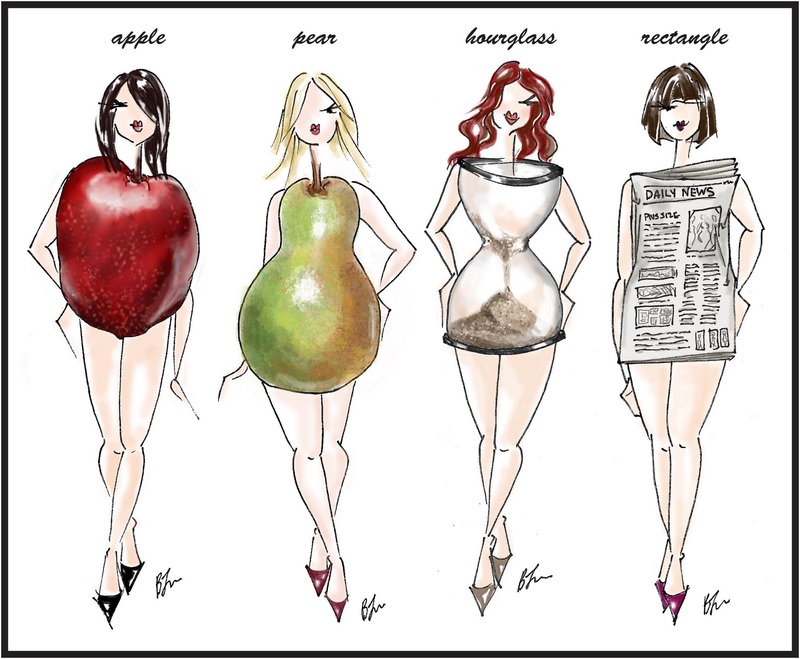 Being apple shaped does not mean that you are overweight! Jackets: Avoid jackets that have shoulder pads and double-breasted pieces. Choose a light material so not to add unneeded bulk to your top-half. For a large bust we want to avoid large lapels or pockets on the upper-half of the piece they will only draw the attention upward and make sure it closes over your bust line. A longer cut with a little flare to it will make you not to appear boxy or short. Go with darker colors like navy or black. Jeans: Look for denim that have a moderate rise, about six to nine inches from crotch to waist. Look for a waistband that hits right below your belly button and that is a little bit wider, but still has some stretch to it. Choose denim that has a slight bootcut to them or that are more fitted to hold to your slim legs. If looking for skinny jeans, go with a pair of jeggings (yes those are a real thing) instead. Dresses: Go with a dress that has an empire waist so that it moves softly away from your body. Choose a v-neckline, which is flattering on apple shapes because it elongates your torso and draws the eyes vertically creating a slimmer silhouette. If you want a slimmer fitting piece, choose a dress that has ruching across the midsection as this will work to disguise the extra weight you carry there. Tops: Similar to dresses, you want tops that move cleanly with your body, so lightweight materials are your friends. Make the most out of pieces that can be belted or have ties as they will work to accentuate your waistline. Aim for pieces that hit you at the top of your hipbone and longer to create a slimming effect across your torso and onto your awesome legs. Materials: Too much material can make you look heavier so choose lightweight materials that move with you in order to create a lighter look. You also want to look for structured materials when choosing pants or jackets, material that is going to give you a definite shape. Tomorrow: 5 Shopping Tips for Pear Shapes!